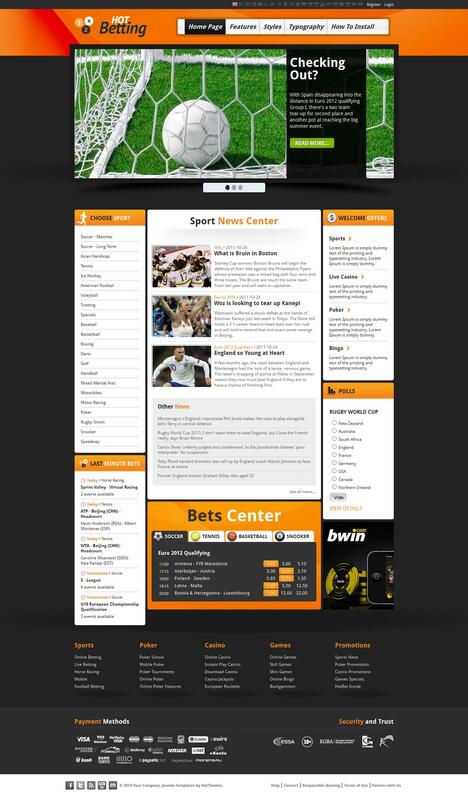 HOT Betting - professional template news topic from the development team HotJoomla. Gorgeous design template is perfect for creating a sports portal with reviews news, upcoming sporting events and display the results of past tournaments and games. The presence of 4 preset designs combined with flexible modular design layout and fast loading pages due to overall optimization of files, ensure the creation of powerful and high-quality website. In the assembly includes club modules Hot Joomla Carousel PRO and Hot Joomla Gallery, designed for a stylish display materials on the site.